The anthodium of perennial herbaceous plant Chrysanthemum indicum L. of family Compositae. Everywhere in China; mainly produced in Jiangsu, Sichuan, Anhui, Guangdong provinces, etc. Collected at the beginning of blossom in late autumn and early winter. Fragrant smell and bitter taste. Globe-like in shape, yellow in color, complete and light flower with aroma and bitter taste. Dried and unprocessed, or the fresh flower is used directly. Bitter, pungent, slightly cold; liver, lung and heart meridians entered. Clear heat and remove toxicity, clear liver fire and pacify liver. Its action is similar to that of Ju Hua, but the action of clearing heat and removing toxicity is much stronger, it is regarded as the good herb for surgical sores and abscess due to heat-toxicity. 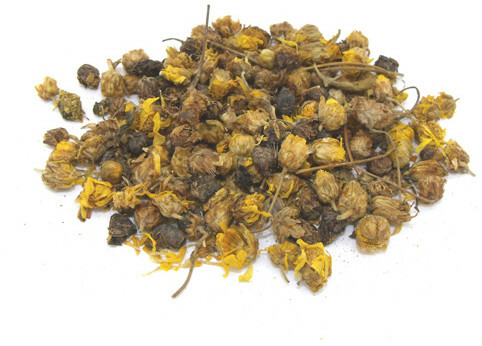 For deep-rooted boils, furuncles, abscess and sores due to heat-toxicity accumulation, it can be combined with other heat-clearing and toxicity-removing herbs, for example, Pu Gong Ying, Zi Hua Di Ding and Jin Yin Hua, etc. , as in Wu Wei Xiao Du Yin from Yi Zong Jin Jian; and the effect gets much better when the fresh products are pounded and applied on infected region, as in Ling Nan Cao Yao Zhi, it is combined with yellow sugar topically. For swollen and sore throat due to heat-toxicity, it is often combined with toxicity-removing and sore throat-alleviating herbs, such as Ban Lan Gen, Niu Bang Zi and Shan Dou Gen, etc. It is also indicated for eczema, rubella and pruritus by means of both oral taking and topical washing simultaneously. It can not only clear liver fire but disperse wind-heat. So it is commonly indicated for red eyes with swollen pain due to wind-heat invading upward or up-flaming of liver fire. It is often combined with wind-dispersing and heat-clearing, liver-clearing and vision-improving herbs, such as Chan Tui, Ju Hua, and Jue Ming Zi, etc. It can also be decocted singly to get the filtered decoction for washing eyes. With the action of pacifying liver yang, it is also indicated for headache and dizziness due to hyperactivity of liver yang, and often combined with herbs for clearing liver heat and pacifying liver, for example, Xia Ku Cao, Jue Ming Zi and Gou Teng, etc. Because it can lower blood pressure, it is often combined with Gou Teng, Luo Bu Ma and Huai Hua to treat hypertensive disease in syndrome of liver heat at present. In addition, it is similar to Ju Hua in actions of dispersing wind-heat and clearing lung heat, and can also be combined with Bo He, Sang Ye and Jie Geng to treat wind-heat exterior syndrome and cough due to lung heat. Decoct 10~15 g. Proper dosage is for topical administration.